Accepting alternative ways to communicate our research. What is it about academic peer review that can make otherwise serious, mature scholars adopt the haughty tone of Stewie Griffin*? Maybe it is easy enough to understand. We are asked to review a manuscript. Flattered that the request confirms our position as the field’s natural gatekeeper, we accept. But the manuscript falls short of our conception of the topic’s Platonic form and keeps us from watching hockey last night. 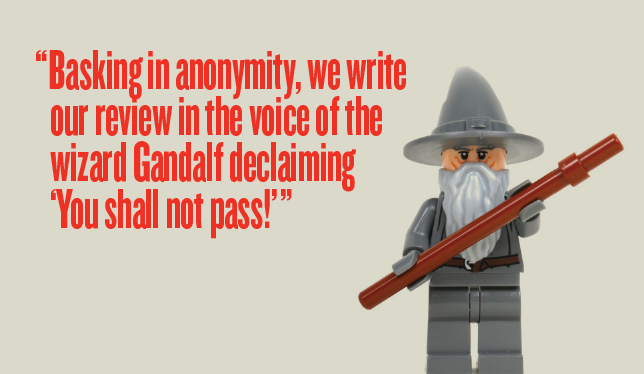 Irritated at it, the journal, the field, and ourselves, and basking in anonymity, we write our review in what we imagine to be the thunderous voice of the wizard Gandalf declaiming “You shall not pass!” But having not spent much time on the review, we fail to achieve the necessary gravitas. We settle for Stewie. Every academic has a horror story or two about their experience with peer review, and yet it hangs on as the gold standard against which all other writing is measured. That has never made much sense to me. For example, I occasionally publish in Canada’s History. I do so not only to ensure that my work becomes better known to dental patients and fathers-in-law, but also because the magazine takes history seriously –it requires that contributors provide photocopies of sources cited. No academic journal or press has ever asked that of me. Yet to many of my peers I would have been better to have published in the obscurest of journals. If two anonymous academics didn’t give it their blessing beforehand it doesn’t really count. For the past 10 years I have been part of a grand experiment in communicating research beyond the academy and its traditional publishing models. NiCHE: Network in Canadian History & Environment received substantial SSHRC funds to support not research itself, but rather its mobilization and dissemination. We built an active website as our virtual home. We developed a bilingual group blog, The Otter. Member Sean Kheraj launched a podcast series, Nature’s Past, now with 45 episodes. We created apps and web exhibits, developed open-source textbooks, and set up speakers’ series in public libraries. We worked with archives, museums, government agencies, and NGOs. We encouraged scholars to think of their work beyond the typical 7,500 or 75,000-word form. It’s still pretty early to evaluate the experiment. My field has, I would hazard, one of the most active digital presences of any Canadian academic group. Scholars in our network seem more open than the average to public dissemination of their work, to collaboration, to experimentation of their own. But whether there now exists more and better historical scholarship than would otherwise have existed is, of course, difficult to say. And I as much as anyone worry that the novelty, immediacy, and prominence of public and digital dissemination – and especially the appeal of having your career continually re-measured in terms of hits, followers, and likes – convinces young scholars to publish their work too early and too often. There is one thing I don’t worry about. At our talks about public and digital dissemination of scholarship, a NiCHE colleague and I have taken to betting when the question will come: “But will an appointments/performance evaluation/promotion committee give credit for that?” Our answer is that as long as you’re doing good work, some faculty members will understand and appreciate where and how you’re doing it – and those who don’t are likely be intimidated, and that’s not such a bad thing for you either. So we don’t worry that careers will suffer. And we notice that the question is coming later and later. *Yes, that’s a Family Guy reference. No, I don’t expect, or recommend, that you watch it. But I’m betting that if you’ve walked by a television this century you know the voice I mean. **That’s a play on a Walter Pater line, and as such a naked attempt to regain scholarly credibility after the Family Guy reference. This is a great column. I’m especially pleased to know that fewer online contributors are fretting over what credit they will get for making a contribution. Perhaps a positive sign for the dissemination of historical research online? In the meantime, we’re publishing the 46th episode of the podcast tomorrow.